Alcuin Lodge Guest House Guest HouseAlcuin Lodge is located within easy walking distance to York's main attractions (5 mins to York centre / less than 10 mins to York Minster) and only 10 mins from the station. Permits for designated parking are available. With 5 double rooms and one twin room, this small guest house is able to provide personalised customer service. Set in a traditional Edwardian family home in a quiet corner, Alcuin Lodge has modern, stylish decor with 4 en-suite rooms and 1 with separate private bathroom (sink and shaver point in room). Rooms include flat screen TVs with Freeview and DVD player, tea and coffee making facilities, hairdryer and towels. Free Wi-Fi is available throughout the house. Traditional English breakfast is freshly cooked every morning, with bacon, sausages, tomato, beans, mushrooms, hash browns, eggs and toast, plus a selection of fruit, cereal, juices, jams and tea and coffee. Special diets are catered for (please make us aware of this when booking). Alcuin Lodge is an Edwardian family home with contemporary décor, providing bed and breakfast. A short stroll away from the centre of York, set in a quiet residential area, this guest house is the ideal base for your stay in the city. Alcuin Lodge Guest House sometimes limits bookings to 2 or more days. Dbl sep. bathrm sometimes limits bookings to 2 or more days. From the A1, take the A19 towards York. After crossing the A1237 (outer ring road) continue towards the city centre on the A19. After passing a village green area on your right and driving under a footbridge, turn right opposite the Churchill Hotel into Bootham Terrace. Take the first right into Sycamore Terrace. Alcuin Lodge is towards the end on the left. From the A1, take the A64 towards York and Scarborough. Take the A1237 outer ring road (avoiding the city centre). At the 5th roundabout, take the A19 towards the city centre then follow direction above. Less than a ten minute walk from the train station / coach dropping off point. 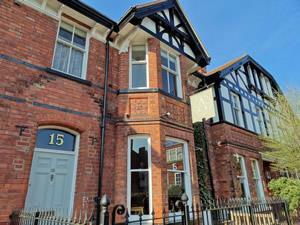 Located in a quite side street within easy walking distance of York Minster and the main tourist sites. Owner was very friendly, room was spacious, clean and had a beautiful ensuite attached. The owner also provided a "parking" permit for our vehicle free of charge which was a very nice touch. My wife and I spent two very comfortable nights at the Alcuin Lodge Guest House and were very impressed with the accommodation. Michael, we really enjoyed having you to visit so it's lovely to know that you had a great stay with us. We're delighted that you were impressed with Alcuin Lodge and we're happy to know you were so comfortable here. I do hope you'll have the opportunity to visit York again. Meanwhile, we hope to see your family and friends when they visit the UK. Thanks for taking the time to leave such lovely comments about your stay. Proprietor has worked with disabled children and adults and has completed training on working with disabled people. Please call us to discuss your individual needs.